↑ Tucker, 1837, v. 1, p. 18. ↑ Malone, 1948, pp. 5–6. ↑ Meacham, 2012, pp. 29, 39. ↑ Meacham, 2012, pp. 11, 49. ↑ Tucker, 1837, v. 1, p. 40. ↑ Gordon-Reed, 2008, p. 348. ↑ Meacham, 2012, pp. 71–73. ↑ Tucker, 1837, v. 1, p. 47. ↑ Brodie, 1974, p. 112. ↑ Peterson, 1970, pp. 101–02, 114, 140. ↑ Ferling, 2004, p. 26. ↑ Tucker, 1837, v. 1, p. 134. ↑ Tucker, 1837, v. 1, p. 334. ↑ ক খ Wood, 2010, pp. 284–85. ↑ Tucker, 1837, v. 2, p. 479. ↑ Rayner, 1834, pp. 428–29. ↑ Bernstein, 2003, p. 189. ১. Prior to the passage of the Twelfth Amendment in 1804, each Presidential elector would cast two ballots; the highest vote-getter would become President and the runner-up would become Vice President. 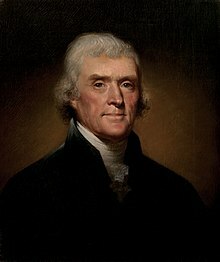 Thus, in 1796, the Democratic-Republican Party fielded Jefferson as a Presidential candidate, but he came in second and therefore became Vice President.